"Streams of refugees into the EU are a US globalization strategy"
Have you already noticed that in the news broadcasts there are always four topics in the center? 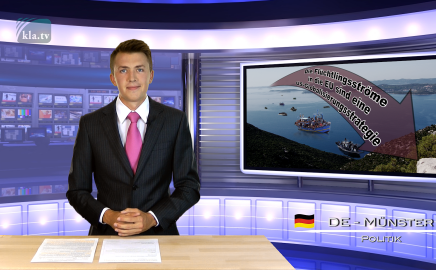 For instance ond Aug 12th 2015 the Swiss Radio station SRF1's headlines were mainly the following: 1. A refugee drama on the Greek island Kos these days. 2. natural oil and gold are as inexpensive as never before 3. the Swiss Francs have devaluated depreciated again and 4. in a report from August 13th: fighter jets of the USA took off in Turkey in order to attack positions of the terror militia Islamic State (IS). These four news reports are not by chance. Because behind those four topics there is a globalizing globalization strategy – the so called four flows. This strategy originated from Thomas P.M. Barnett, a US Aamerican political scientist and military geo strategist. We already reported in detail about on Barnett and “GThe globalization as a key for world wide US dominance” in yesterday's the German broadcast of on August 14th. How globalization is put into practice and advanced furthered today, Thomas P.M. Barnett already explained in his globalization strategy of the four flows. I quote Barnett from his book published in 2004 - „The Pentagon's New Map“ (retranslated from German) “In order for (globalization) to function smoothly, there need to be four constant and unhindered 'flows'“: “The unhindered flow of peopleimmigrants” - whereas this mainly aims at Europe and no government or institution may hinder this. “The unhindered Flow flow of natural oil, natural gas and all other resources” - these resources may not be in the hands of states, but must be privatized or internationalized. “The in-flow of credits and investments and out-flow of profit...” - it's aboutin order to create a counterwise dependency of nations and with profits shall be in US Dollars flowing and unhindered flow towards the USA. “The unhindered flow of US American security technology and forces...” - no state may hinder US military actions or other US supported wars. . In our today's broadcast it is about point 1, the unhindered flow of refugees, which we shall want to take a closer look at. In all this, Barnett unmistakably aims at Europe: Up Up untilto the year 2050, Europe must allow take in 1.5 million instead of merely 300,000 immigrants per year. Yet one can accept assume that Barnett's prophecy will be fulfilled much earlier. Superficially, Barnett's reason is to keep the fast agingthe population of number in Europe at a constant level in numbersince Europe is faced with a quickly aging population. To achieve this, Europe shall open his gates to an unhindered flow of immigrants. In reality, Barnett is more concerned about about economical interests and – as we already reported on in our German broadcast of on April 24th 2015 - “....” “by a mixing of rates” a population shall be created whose average intelligence quotient (IQ) level is at 90 - intelligent enough to work, simple-minded enough not to raise opposition. For in the so-called “core countries”, a mighty resistance i9s growing. On the one hand, they do not neglect economical advantage, but, I quote Barnett from his book “ ... … they would fear the loss of their identities inside a conformed urbanized, split mass in which everyone only supports their own interests. “ All those opposing against “the mingling of races and cultures...” Barnett calles “idiots” as well as “revolutionaries and terrorists?” … which must be fought with all means. I quote Barnett: ”Right-wing, immigration-fearing politicians have to be silenced and forced off-stage and fast” … He also threattenes “Yes, I acknowledge the insane arguments of our opponents. But if they should resist against the global world order, I would demand: Kill them!” HowWhat the US American lead penmanship behind the refugee streams shows in practice, this we have already reported on in April in our broadcast: “Modern Warfare against Europe – US ships bring refugee masses to Europe”. 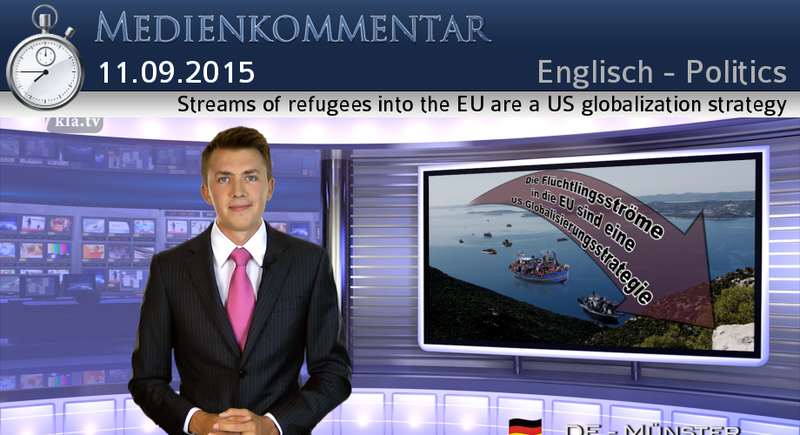 Other examples for this you will see in tomorrow's our next broadcast: “The US American signature behind the refugee streams”. Good bye.